The froggy friend makes it so much fun! Everywhere baby looks (in the spinning seat, he can look all around! ), froggy offers something fun to do—spinning, bouncing, sliding, batting, and more! Baby can even activate sounds and music! And the best part is, all this entertainment only takes up about half the space of other entertainers, which means less clutter in your home. It’s safe jumping fun rewarded with lights, sounds and music! Sturdy, free-standing steel frame lets baby jump safely--no doorways required. Soft spring covers keep little fingers safe and three-position height adjustment ensures a custom fit. Plush seat pad is machine washable and dryer safe. Requires 3 AA batteries (not included). Use only for a child who is able to hold head up unassisted and who is not able to climb out or walk. • Moving and jumping enhances large motor skills. • Variety of textures integrated into toys provide tactile stimulation. 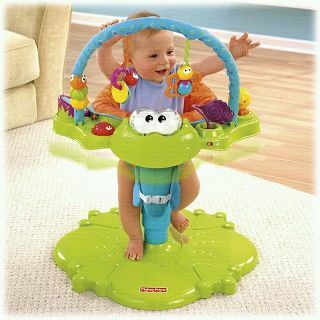 • Colorful toys, fun sounds and music stimulate baby’s visual and auditory senses. • Baby’s actions make things happen, helping baby understand cause and effect. • Reaching and grasping onto toys fosters eye-hand coordination. • Peace of mind—safe alternative to walkers and doorway jumpers. • Less clutter in your home--all the fun of other entertainers in HALF the space!